phase of womans advancement," the rest of the afternoon was devoted to descriptions and scenes of Capitol life. It was voted to still discuss the Congress of our next meeting. Adjourned [feeling?] the afternoon well spent Mrs. Mitchell Pres Mrs. Alexander Secy. 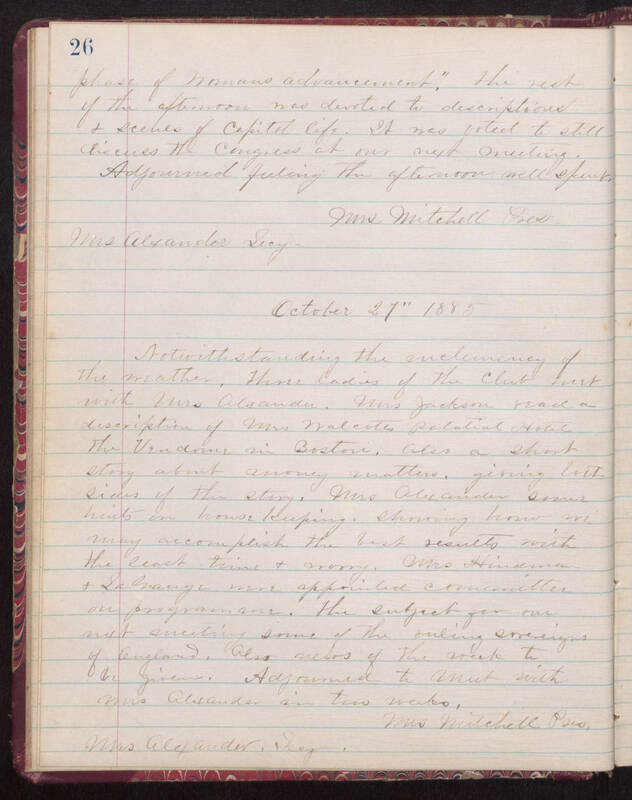 October 31" 1885 Notwithstanding the [unwelcoming?] of the weather, three ladies of the Club met with Mrs. Alexander. Mrs Jackson read a description of Mrs Walcotes paladial home the Vendome in Boston. Also a short story about money matters, giving both sides of thestory. Mrs. Alexander some hints in housekeeping, showing how we may accomplish the best results with the least time and worry. Mrs. Hinderman and La Mange were appointed committee on [programs?]. The subject for out next meeting some of the ruling [egregious?] of England. Also [illegible] of the week to be given. Adjourned to meet with Mrs. Alexander in two weeks. Mrs Mitchell Pres. Mrs. Alexander Secy.